Hiroshi SHIBATA / GMO PEPABO inc.
• Maintain *.ruby-lang.org. Applied to Site Reliability Engineering. • Users can specify tasks with prerequisites. • Supports parallel execution of tasks. • It’s also declaration named `Filelist` on Toplevel. • It has utility class for File listing. • Rake 0.9 bump to 10.0 for next version. • Rake follows this release policy now. 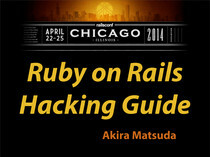 Rake is most downloaded gem in the ruby world. • Ruby is readable language. Because we often use internal DSL. We need to prepare to configuration for gem behavior changes. We can implement `Explicit code block` used instance_eval. • rake_module.rb: defined `Rake.application` for Rake singleton instance. • Rake.application returns `Rake::Application` instance. • If you add `-P` options, top_level shows dependencies of target task. • top_level invokes tasks given command line. Example for `rake foo bar buzz`. • top_level methods are under the thread pool on Rake. • load_rakefile simply load Rakefile used by `load` method provided by Ruby. • `Rake::TaskManager#define_task` build actions, dependencies and scope for task. actions are stored code blocks. @actions << block if block_given? • Capistrano is a framework for building automated deployment scripts. desc "list [SEARCH]", "list all of the available apps, limited by SEARCH"
• `Bundler::CLI` inherited Thor class. It’s simple thor command. • I’m sorry to inconvenience experience for above breaking changes. • Without bundler, you need to install hoe and their plugins. • I sometimes rewrite gem release tasks at rake, psych, syck…etc. additional debug/warn message with your ruby code. another `verbose` option. It shows test name and results for test suites. But It’s same behavior this. • This is major version-up. I have plan to some breaking changes. • Current implementation detects core number used by system utilities like `sysctl`. • But Ruby 2.2 provides `Etc.nprocessor` for detects core number natively. • I like ruby core function. Rake 12 only supports Ruby 2.2 or later same as Rails 5. • Rake defined task method under main instance provided the Object class. • We cant use name of `task` on irb/rails console when you use Rake gem. • I hope to solve it. • Summarize Rake history and basis. • Propose Rake 12 future.